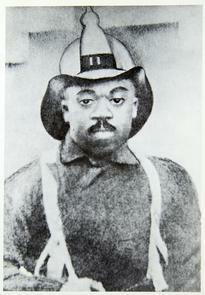 Portrait of Isaac Jacobs of Engine 11. Shown in uniform. Caption: "Appointed April 13, 1886, Service terminated November 24, 1890." "Leather Lungs" / by Joseph A. Marshall. Philadelphia : Dorrance, .